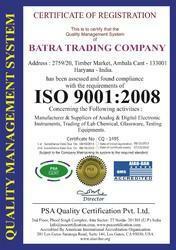 Established in the year 1988, we, “Batra Trading Company”, are engaged in manufacturing and supplying impeccable array of Electronics Instruments and Lab Equipment. As an ISO 9001:2008 certified association, we provide best quality Physics Lab Instruments, Electronics Instruments and Optical Lab Instruments. The offered products are manufactured and designed in our fully equipped manufacturing unit by utilizing optimum quality mechanisms and cutting-edge knowledge in compliance with industry quality values. Our offered products are highly demanded among customers for optimum efficiency, high accuracy, superb performance, robust design and longer service life. We have extremely knowledgeable team of quality supervisors. For manufacturing finest goods, our quality supervisors severely check them on various standards to ensure their perfection at par with the industry norms. We are dedicated for building sound and equally beneficial contacts with our customers because we are a client oriented association. Additionally, we have received a lot of gratitude from our customers due to our optimum quality products. We constantly strive hard to offer supreme gratification to our customers through numerous policies like wide distribution network, client centric approach, effective pricing, timely delivery and transparent dealings. Under the dexterous guidance of our Proprietor, “Mr. Anil Batra”, we are able to achieve supreme satisfaction and trust of our customers. His innovative ideas and wide industry knowledge has assisted us to attain the foremost position in the market. Well-organized human resource serves as the energetic force behind the prosperous journey of an association. By keeping this in mind, we have employed knowledgeable and diligent team of specialist that help us in providing optimum quality products. These professionals are choosing after stern recruitment process and work in the path to improve quality throughput in the manufacturing process. In order to achieve our objective of manufacturing outstanding quality Electronics Instruments and Lab Equipment, we have always relied on our state-of-art infrastructural base. We have established a hi-tech production division for the production of products. The production division is installed with current machinery and equipment in order to manufacture reliable assortment of products. Research is at the heart of our industrial process. To keep long term connection with our clients, we endeavor to offer the best in class metal abrasives. We always put sincere efforts to recognize the customer’s prospects and work hard to find new and improved ways that can improve the quality of our complete products. 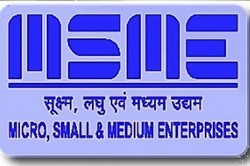 The Ministry of Micro, Small and Medium Enterprises , a branch of the Government of India, is the apex body for the formulation and administration of rules, regulations and laws relating to micro, small and medium enterprises in India. We are dealing test and measuring instruments of the most renowned brand along with our brand BTC.